It all started so simple in the 60's when a young biker (founder Al Patterson) was smitten with the California Chopper Craze, after riding the US and a trip to Sturgis in the late 60's, long before the crowds of today. He began building and chopping his and his friends bikes, mostly making the parts because there were no custom shops to speak of in Canada at that time. 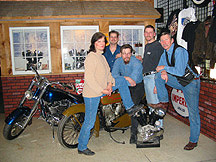 In 1971, with a few years of playing under his belt, Al and his wife Lynne formed A. L. CHOPPERS. Business boomed and the demand for custom parts grew, so we began to import parts to supply our business and others. A.L. 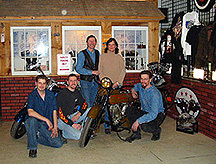 Choppers was one of the first custom shops in Canada and introduced Ontario to the likes of JAMMER CYCLE, EASYRIDER, DRAG SPECIALTIES and S & S CYCLE. Al was first to bring Easyrider Magazines to Ontario, which (believe it or not) was illegal in the 70's and forwarded hundreds out to enthusiasts around the country. The business has flourished, and after 30 years, has become well known for its fair and helpful service. It is now a family company, headed up by Al and Lynne, with the help of their three sons Adam, Aaron & Andrew, all with special talents to help service A.L. Choppers growing customer base.